Let's just get this issue out of the way: This cookware doesn't compare to something like All-Clad. But at this price, who cares? Circulon offers fantastic cookware at a fantastic price. You can tell a Circulon pan from the telltale circular grooves. They claim that they protect the nonstick coating from wear by exposing only a small portion of the nonstick surface to cooking. I'm not a fan of cookware sets in general. I find that some pots and pans are great for everyday use. And others just never get used. Especially with a larger set like this one. But, on the plus side, with a set this large, you're bound to find a pot for every need. And this set has a good mixture of pots. And skillets. It even has a stockpot, which is often left out of cookware sets. So you get every standard piece that a cook would need -- what a value! 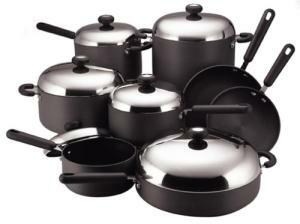 Here's another Circulon cookware set to consider.